In the course of the Syrian Civil War, two major rebel factions have emerged who share al-Qaeda's ideology: Jabhat al-Nusra (JN), which was founded at the beginning of 2012 by Abu Mohammed al-Jowlani, and the Islamic State of Iraq and ash-Sham (ISIS). In April 2013, Abu Bakr al-Baghdadi, the leader of the Islamic State of Iraq (ISI—the umbrella front for al-Qaeda in Iraq), proposed that JN and ISI merge together. He thus announced the formation of a new Islamist polity, ISIS, which included territories in Iraq and Syria (ash-Sham). Baghdadi argued that Jabhat al-Nusra had been initially set-up with financial support and manpower from the ISI and therefore that the Syria-focused JN was a mere "extension" of the Iraq-based organization. Jowlani, however, rejected Baghdadi's proposal to combine their efforts on the grounds that he was not consulted. Subsequently, he renewed JN's bay'ah (pledge of allegiance) to Ayman al-Zawahiri, the leader of al-Qaeda Central. In June of 2013, al-Jazeera revealed a leaked letter in which Zawahiri ruled in favor of maintaining a separation between ISI and JN in Iraq and Syria respectively. The network released video footage of Zawahiri reading the letter aloud in November 2013. Many observers interpreted this televised pronouncement from al-Qaeda Central's leader as a renewal of the call to disband ISIS, although sources within ISIS circles inform me that the video in question had, in fact, been in private circulation among their members for months. In any event, Baghdadi has personally rejected the call to disband ISIS. Similarly, ISIS's new official spokesman Abu Mohammed al-Adnani, a Syrian veteran of the Iraq War, has also rejected the proposal in even more forceful terms, going so far as to accuse Jowlani of "defection" and affirming that ISIS would not accept geographical limitations based on "Sykes-Picot." There are variations in the membership composition of both JN and ISIS that are worth noting. Indeed, the differences between the two groups have national as well as ideological dimensions. JN has a greater proportion of native Syrian members in its ranks, while most foreign jihadis fighting in Syria have declared their allegiance to ISIS. The national differences between the two factions are significant; however they must not be exaggerated. Most foreign fighters in Syria are disproportionately represented among ISIS's leadership and elite paramilitary corps. The vast majority of ISIS fighters in the rank and file, however, are Syrian nationals. Therefore, while there is a distinct national difference between the two groups, it is not the most important factor that distinguishes them from each other. In the first few months after Baghdadi announced the formation of ISIS, its relationship with JN in Syria was not always clear. In March 2013, for example, members of the local JN faction under the leadership of a local commander called Abu Sa'ad al-Hadrami seized the city of Raqqa . The names and banners of JN and ISIS remained interchangeable throughout the city until July 2013. Hadrami had, in fact, pledged allegiance to Baghdadi, but he was not opposed to the presence of the JN. By July of 2013, circumstances had changed: Hadrami reaffirmed his allegiance solely to JN. He cited concerns over ISIS's conduct in Raqqa and argued that continuing to wage jihad under the name of ISIS constituted disobedience to Zawahiri. Subsequently, he withdrew from Raqqa with his followers to Tabqa, and announced a return to Raqqa in September 2013 under the banner of JN. The return of JN to Raqqa as a faction that is distinct from ISIS reflects the widening gap between the two groups over time. JN still cooperated with ISIS in the overall administration of the city through participation in Raqqa's Sharia Committee, a ruling body that also included the Salafist faction Ahrar ash-Sham. However, distrust between JN and ISIS became increasingly apparent. Tension between the two groups boiled over last summer. In August of 2013, ISIS expelled the main FSA contingent in Raqqa thereby leaving many fighters in the city with no army to which to pledge their loyalty. As a result, ISIS and JN began to compete for new recruits among those formerly aligned with the FSA. As such, ISIS has tried to seize some of the bases of these former FSA fighters only to have JN intervene to stop them in the name of the FSA's allegiance to the Syrian JN. Violence between the two al-Qaeda-inspired groups followed. As the opposition outlet Aks Alser recently reported in November 2013, ISIS tried to seize an apparent JN base in Raqqa leading to exchanges of gunfire. A local contact explained to me after the incident that it was not strictly a JN base, but rather the headquarters of Jabhat al-Tawheed, a battalion that had previously pledged allegiance to JN. Despite the turf wars and violence between ISIS and JN, not all those who have pledged their allegiance to JN or ISIS are necessarily hostile to members of the other faction. For example, the Kata'ib Junud al-Haq, a battalion of rebel fighters in the Syrian town of Abu Kamal on the border with Iraq, initially declared itself a branch of JN. It later switched its emblem and pledged allegiance to ISIS, only to then revert back to JN after Zawahiri's letter emerged calling for the separation of the Iraqi and Syrian jihadist groups. During the battalion's time as an ISIS affiliate, however, the group's Facebook page still featured imagery in support of JN, such as photos of JN banners. Furthermore, in an interview I conducted in November 2013 with Kata'ib Junud al-Haq's media activist Zaid Osama Albukamali, the battalion's representative made it clear that despite the reversion to an exclusive JN allegiance, Kata'ib Junud al-Haq is not hostile to ISIS and seeks cross-border cooperation, even though it supports Zawahiri's directives for separation between ISIS and JN in Syria. Open hostilities notwithstanding, there have been plenty of instances in which both JN and ISIS have managed to cooperate in Syria. Examples include a siege of the base of the Syrian Army's 17th Division in the Raqqa governorate, a coordinated offensive against regime strongholds in the Homs desert area, as well as operations against the Kurdish YPG (Yekîneyên Parastina Gel) militias and regime forces in the Qamishli area. In each of these operations, both groups have succeeded in uniting against a perceived common enemy. Despite the capacity of both factions to cooperate, the JN-ISIS split is perhaps the greatest internal division in the transnational jihadist movement in a single country. It is also the only known instance in which a local commander, the emir of ISIS Baghdadi, has openly disobeyed the al-Qaeda Central emir Zawahiri. The JN, by contrast, has more recently gone to great lengths to stress its loyalty to Zawahiri. In fact, the JN has begun using an alternative name on its banners, "Al-Qa'ida in Bilad ash-Sham," amid alleged attempts by other rebel groups (e.g. the Islamic Front's Jaysh al-Islam under Zahran Alloush) to co-opt JN away from al-Qaeda. In assessing these instances of cooperation and divergence between JN and ISIS and its implications for the future of the jihadist rebellion in Syria and Iraq, it should be noted that the dynamics on the ground between the two groups remain very fluid and contained. Open conflict on a national scale between the two factions anytime soon is highly unlikely. Moreover, given the ideological leanings of the current JN leadership, it is also unlikely that they will drop their affiliation with al-Qaeda Central. As evidence of the competition between JN and ISIS mounts, both factions have tried to consolidate local political support by intensifying their public outreach efforts. Their respective bids to "win hearts and minds" have involved a wide array of activities, from media outreach to the provision of economic aid and social services such as running bakeries and supplying bread at prices lower than those in the conventional black market. Furthermore, both groups have shunned engaging in criminal behavior, a practice that has favorably distinguished them in the public's eyes from the FSA-banner groups in the rebel-held northern areas. ISIS has arguably distinguished itself from all of the other rebel groups in its outreach to Syrian populations by employing social media with remarkable effectiveness. Indeed, the extent of ISIS's political and media outreach aimed at garnering local support is unprecedented in the history of global jihadist movements. ISIS is trying to demonstrate in Syria that it has somehow "learned the lessons" of al-Qaeda's failures to hold onto power in the Anbar province and its ultimate defeat in the Iraq War. When Abu Musab al-Zarqawi was at the helm of al-Qaeda and the jihadist insurgency in Iraq, the Al- Qaeda fighters behaved with extreme brutality towards Sunni Arab locals. This helped to ignite the "Anbar Awakening" that in the course of the U.S.-led troop surge in Iraq resulted in the formation of the anti-al-Qaeda Sahwa movement. Now, ISIS has tried to show that it has taken great care not to repeat those mistakes in Syria. Indeed, ISIS has carefully crafted and implemented a political strategy that calls for the establishment of its own political institutions. Given its success, ISIS will be able to realize its wider, transnational project: the incorporation of territories in both Syria and Iraq. Looking into the future, the group's ultimate vision is to establish a Caliphate across the Muslim world. Currently, ISIS's political control over Syrian territory has exceeded anything that ISI accomplished during the Iraq War. The group has maintained exclusive control over some eastern localities in the Hasakah province and several northern border strongholds in the Aleppo and Idlib governorates, such as ash-Shaddadi in Hasakah, the towns of Azaz and Jarabulus in Aleppo, and until January 2014 ad-Dana in Idlib. The group has also governed multiple districts of the Aleppo urban center and metropolitan areas, such as Tariq al-Bab and Mashhad. Until now, however, the predominant method of ISIS governance has consisted of joint rule through a coalition with other groups. As a result, ISIS lacked the ability to dislodge rivals from the majority of the localities where it has a presence. In the Aleppo governorate, for example, ISIS has shared power with other rebel factions in towns such as Manbij and al-Bab. Tensions have, in fact, emerged in both places over the ISIS presence: locals regularly accuse ISIS of unilaterally asserting sole control over services like baking and distributing bread. In the Idlib province, there has been an ISIS presence in several towns, including Ma'arat an-Na'aman and Saraqeb. In the Raqqa province, ISIS is arguably the most prominent faction of the provincial capital and one of the main groups in the important northern border town of Tel Abyaḍ. There is also an ISIS presence in most of the remaining rebel strongholds in the Latakia province along the Mediterranean coast, as well as in the towns of the southeastern province of Deir az-Zor. In the Damascus governorate, ISIS has a much smaller presence. It has controlled a single locality: Yabroud. Yet the group runs a training camp in Ghouta, and it regularly harasses Assad's forces in the Qalamoun Mountains, East Ghouta, and in regime-held districts in the city of Damascus. The Deraa governorate on the Jordanian border, by contrast, lacks a substantial ISIS presence and is dominated by Jabhat al-Nusra. ISIS is distinguished from other rebel factions in Syria for its financial resources. ISIS enjoys substantial monetary support from donors in the Persian Gulf, an extensive extortion network in Ninawa province of northwestern Iraq and control of some oil reserves in eastern Syria. Financial support for ISIS likely increased after the group directed a successful prison break from Baghdad in July 2013 that freed hundreds of fighters who had been imprisoned since the insurgency in Iraq of 2006-7. When ISIS establishes itself in a new locality, particularly one already in rebel-held areas, it aims to consolidate its authority through outreach to locals in the form of da'wah meetings. (The term da'wah literally means 'call' or 'invitation' in Arabic and is more widely used in Islamic discourse to refer to missionary outreach to non-Muslims.) For ISIS, da'wah meetings are opportunities to both build-up ties to Muslim locals in an attempt to promote their ideological worldview, and to strengthen their political power. In addition to convening meetings in public spaces, other forms of da'wah outreach include the distribution of pamphlets outlining ISIS' ideology and establishing da'wah offices. ISIS' da'wah outreach, of course, continues well-beyond the group's initial establishment of its presence in the locality. In a bid to ensure that their political rule lasts, ISIS's da'wah efforts have particularly targeted children. The group has also sought to recruit children during Muslim religious festivals by offering them gifts. The most egregious case of this took place in ad-Dana, where ISIS distributed Western-brand toys, including Spiderman and the Teletubbies, on Eid al-Fitr. As part of its wider strategy to foster a new generation of Syrians in support of its ideological agenda, ISIS also runs a number of schools in areas where it has consolidated its presence. Unlike the Afghan Taliban, ISIS does not prohibit girls from attending school, but the group does enforce gender segregation and normally requires girls from the fifth year of primary school (that is between the ages of 10 and 11) to wear proper Islamic dress in order to attend. ISIS offers other services to complement their educational outreach, such as their school-bus services in the Aleppo town of al-Bab. For both boys and girls, lessons in ISIS schools do not consist of anything beyond rote memorization of the Qur'an and Sunna (the latter referring to the Prophet's example as outlined in the Hadith and the Sira), religious exegesis, and the history of the Rashidun Caliphs of Islam. Some evidence indicates that ISIS is using textbooks in schools in Raqqa and Jarabulus whose contents and covers have been plagiarized directly from the Saudi Ministry of Education. The textbook on Tawhid, Monotheism: a Central Doctrine in Islam, is the most noteworthy example. Because of the limited nature of the ISIS curriculum, the group has little to offer in the way of conventional university-level education. In Raqqa, where a number of colleges exist, ISIS has used the facilities to host da'wah meetings for university students. In cities like Raqqa, ISIS is also providing education in mosques. In addition to its educational initiatives, ISIS has also set up Islamic courts in areas where it has established a presence. ISIS considers Sharia to be the sole source of legislation, and the application of "Islamic justice" includes the use of hudud corporal punishments for an assortment of crimes such as theft and blasphemy. Sharia is also applied in family disputes. In addition to administering Islamic courts, ISIS has also begun providing law enforcement; in some areas, it has set up police stations that have their own patrol cars. ISIS's Sharia-enforcement squads have targeted those accused of being "Alawite soldiers" and defenders of the Assad regime, as well as rival rebel leaders with a reputation for warlordism. Recently, ISIS "police" squads in the Aleppo governorate wiped out a gang known as the Ghuraba ash-Sham (Strangers of ash-Sham). While the Ghuraba group has a reputation for ideological "moderation" compared to al-Qaeda-inspired groups, it was renowned for its criminality not only in the eyes of ISIS but also a variety of other rebel factions. ISIS in Syria has also applied the classical Sharia concept of dhimma (literally, "protection pact") in its conduct toward minority Christians. In this, Christians are subjected to treatment as second-class citizens, and their lives and property are threatened if the conditions of dhimma (e.g. payment of the jizya poll tax)are violated. In Tel Abyaḍ, for example, ISIS desecrated the local Armenian Church at the end of October 2013 on the grounds that it violated the dhimma pact. Meanwhile, ISIS has taken advantage of the fact that most Christians have fled the sectarian violence in Raqaa to convert the churches into ISIS-run da'wah offices. Since the days of 9/11, pundits have often debated what the goals of al-Qaeda and its affiliates are. Some describe al-Qaeda as a reaction to Western foreign policy in the Middle East and they characterize the jihadist movement's goals as limited to expelling foreign forces from the Muslim world. Others see al-Qaeda's goals as much more ambitious, and focused on the establishment of a new Islamic political order. ISIS's portrayal of its' own goals in Syria-Iraq indicate that it seeks to establish an Islamic state that can become the core of a new Caliphate that will eventually strive to dominate the rest of the world. Despite their ongoing disagreement with Zawahiri, ISIS abides by Osama bin Laden's dictum that there are only three choices in Islam: conversion, subjugation, or death. ISIS's presentation of these goals in Syria contrasts the image it is trying to establish for itself in Iraq, where it lacks any substantial territorial control and the mechanisms of a proto-state. In Iraq, ISIS has tried to portray itself as the protector of the Sunni population that is defending against provocations from the "Safavid" government. ISIS's globalist pretensions are evident in the video testimonies of its members from Syria. In one case, an ISIS fighter named Abu Omar al-Ansari, who participated in the ISIS-led capture of the Mannagh airbase in the Aleppo governorate in August 2013, makes it clear that it is necessary to establish an Islamic state over the entire world, and that the project is not limited to Syria. In another video testimony, an American fighter for ISIS, Abu Dajana al-Amriki, expressed similar sentiments: "We'll bring the right of Islam to rule all of the entire world." British ISIS fighters interviewed by the publication VICE have also expressed the same view. Indeed, ISIS's discourse is much more open on the matter of building a more transnational caliphate than that of JN, and has clearly impacted the movement's political strategy. In Aleppo, ISIS supporters have notably established a "Coordination [Network] of the State of the Caliphate" to organize demonstrations demanding the establishment of a pan-Islamic Caliphate. These rallies occur regularly after Friday prayers in areas of Aleppo that have been ISIS stronghold districts like Tariq al-Bab. 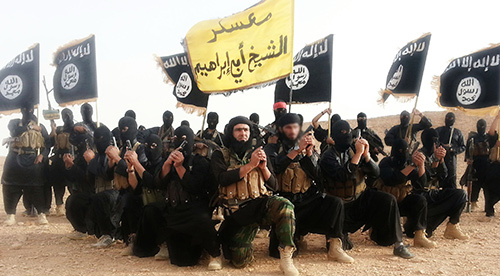 In the nearer term, ISIS has stated that its most immediate goal is to establish a single Islamic state spanning the territories of Iraq and Syria. In this, they've acted in accordance with Baghdadi's pronouncements that JN and the ongoing jihad in Syria are mere "extensions" of ISIS's campaign in Iraq. After successfully setting up the institutions of a proto-state in many areas, ISIS has become increasingly emboldened to express its real desires, that is, to become the staging ground for a larger transnational jihad. ISIS in Syria embodies three important new trends in the overall development of the global jihad movement. First, the group's existence in Syria marks an open challenge to the leadership of al-Qaeda Central, and to Zawahiri's directives in particular. An unprecedented split in the jihadist movement in the Fertile Crescent has resulted. Though ISIS is striving to realize the same transnational political vision as al-Qaeda's central leadership, the ISIS leader Baghdadi has been purposefully ambiguous about whether he or his group has any sort of allegiance to Zawahiri. Is Abu Bakr al-Baghdadi seeking to establish himself as a Caliph by launching his own Islamic state-building project in Syria independent of Zawahiri's directives? If so, then infighting with Jabhat al-Nusra, whose ultimate amir is Zawahiri, will become a logical inevitability. Will ISIS and its leader Abu Bakr al-Baghdadi eventually displace al-Qaeda Central and Zawahiri as the main figures of reverence for jihadist fighters and their supporters worldwide? This, of course, will ultimately depend on ISIS and the success of its efforts in Syria. Second, ISIS in Syria has enjoyed a level of success in the founding of an Islamic state that is unmatched by any al-Qaeda affiliate or group sharing al-Qaeda's ideology. Because of its efforts to design and implement a political strategy through social services, the media and educational outreach, it is likely that ISIS in Syria will become the model for current and future jihadist movements seeking to consolidate their control over territory in a lawless environment. Third, despite the disagreement among ISIS members as to whether ISIS is actually an al-Qaeda affiliate, it is ISIS in Syria that perhaps most openly expresses the global jihad movement's true long-term goals: namely, the establishment of a Caliphate that should encompass the entire world. Nevertheless, the future viability of ISIS's "state-building" and its political outreach is in serious doubt. The situation in Syria is simply far too fragmented to allow ISIS to unite the country as a whole under its rule. Indeed, for ISIS to achieve such a goal requires opening up too many fighting fronts, an approach that has already cost ISIS some significant territorial control within Syria. Such is evident in ISIS's open conflict with the Kurdish YPG militias following its expulsion from the northern border town of Ras al-Ayn in July 2013. While ISIS quickly countered by expelling pockets of YPG militias from multiple locations in the Raqqa and Aleppo governorates (such as the Jarabulus area in July 2013, and Tel Abyaḍ in August), the group has suffered serious setbacks in the far northeast at the hands of the YPG. As a result, ISIS commanders have had to rely on reinforcements from the Ninawa province in Iraq. This diversion of manpower to the northeast has resulted in weaknesses along the Aleppo front against regime forces. Consequently, the Assad regime has managed to exploit rebel infighting in the Aleppo area and to retake some territory. Moreover, despite ISIS's political outreach, the group faces a fundamental problem in dealing with other rebel factions and thus in consolidating political control. This is partly because ISIS already sees itself not merely as a "group" or "faction" like the other rebels but as a "state" that has the prerogative to rule over all others. Therefore, ISIS is inherently unwilling to share power, and often adopts a particularly brutal approach to dealing with other rebel factions. In fact, insurgent groups in Iraq, like Jamaat Ansar al-Islam, and also in Syria, like Ahrar ash-Sham, have all complained about ISIS' intractability. Tensions between ISIS and other rebel groups are likely to grow, as the serious infighting between ISIS and other rebel groups in Aleppo, Idlib, Raqqa and Deir az-Zor governorates suggests. In January 2014, ISIS killed a leading figure in Ahrar ash-Sham, Abu Rayyan, who had attempted to mediate a dispute between Ahrar ash-Sham and ISIS over the latter's seizure of an Aleppo town called Maskanah. In all likelihood, the murder will exacerbate existing tensions among the Islamist rebel factions. At present, two rebel coalitions—the Jaysh al-Mujahideen of Aleppo and the Syrian Revolutionaries Front in Aleppo, Idlib and Hama—are committed to evicting ISIS out of Syria. A third coalition that formed in November 2013, the Islamic Front, has been more ambiguous with respect to ISIS. While some of its fighters have battled with ISIS, the Islamic Front's leaders do not indicate a desire to destroy ISIS per se, but rather lack the ability to restrain their fighters in various localities. ISIS has weakened itself by fighting along too many battlefronts; it has spread itself too thinly in various towns where it has sought to consolidate political control. On January 10, 2014, rival factions evicted ISIS from almost all Idlib localities except the town of Saraqeb. In Aleppo, Azaz remains the only substantial ISIS stronghold in the Raqqa province. Even there, however, ISIS must continually fight with FSA-banner militants who pledged allegiance to Jabhat al-Nusra in the city of Raqqa. In Deir az-Zor province, fighting broke out in the town of Mayadeen between Ahrar ash-Sham and ISIS, culminating in a suicide car bombing by the latter against the former's local headquarters in the town. It is worth noting that the rebel groups that have emerged in opposition to ISIS differ from the ones which ultimately became the Iraq "Sahwa" movement in three important ways. First, Islamic Front fighters generally decline to have any kind of Western support in the fight with ISIS. Second, this fighting has been spontaneous and opportunistic, rather than a pre-planned initiative against ISIS. For example, the murder of Abu Rayyan provoked widespread demonstrations in northern Syrian towns against ISIS, thereby allowing members of the Syrian Revolutionaries Front and the Jaysh al-Mujahideen to exploit the opportunity to attack ISIS. The squabbling that ensued dragged Islamic Front fighters into the conflict. Third, there is a degree of localization to these clashes: Ahrar ash-Sham fighters still collaborate with ISIS on the Qamishli front against the YPG, and some Ahrar ash-Sham affiliates (e.g. in Tel Abyad) refuse to fight ISIS. Likewise, Jabhat al-Nusra tries to play a mediating role in Damascus and Idlib provinces and to protect ISIS fighters in Qalamoun. So far, ISIS's loss of territory has been substantial, but the infighting among these rebel Islamist groups should not be construed as the beginning of the end of ISIS in Syria. The group can still retreat into the shadows in its all out-war against the "Sahwa" among the rebels (to quote ISIS's spokesman in a recent speech on the clashes), and it can pursue clandestine sabotage attacks in an attempt to undermine its rivals within the rebel ranks. Thus, the ISIS bombings and assassinations targeting Sahwa militiamen that we observe in Iraq with regularity today may well become the new norm in Syria. Since January 2014, however, ISIS's brutal conduct toward rival rebel groups has drawn strong condemnation from central figures in al-Qaeda. In one instance in Jarabulus, an ISIS suicide car bomb targeting other rebels killed 33 people. Abu Khalid al-Suri, the man appointed by Zawahiri to mediate between ISIS and Jabhat al-Nusra, has since released a statement distancing bin Laden, Zawahiri, and even Abu Musab al-Zarqawi from ISIS's recent "crimes." He called on ISIS members to repent. It now appears the gap between al-Qaeda Central and ISIS will continue to grow.